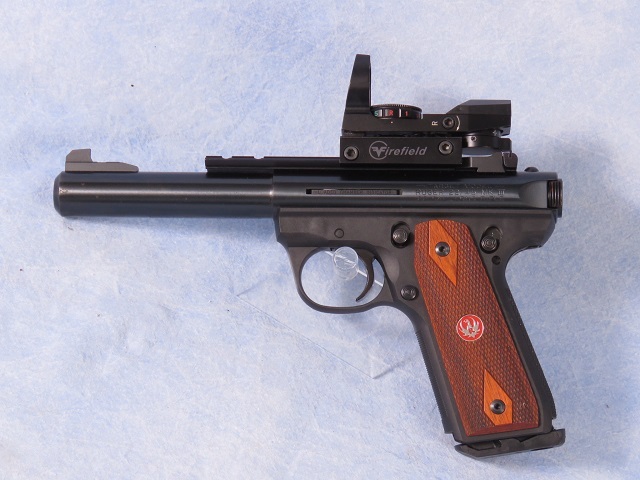 Ruger model MKIII semi-auto pistol chambered in .22 LR. This is a last model year (2015) 22/45 MK III Ruger. Features a 5 1/2" heavy barrel, steel frame, 1911 slant grip with checkered diamond Coca Bola grips. Former owner set a Firefield red/green dot sight on the rail. Very clean gun. Barrel Length - 5 1/2"